Old money (from larger ephemera collection). I read about your project on Etsy and just had to stop by. 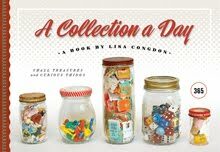 I too love collecting (and also arranging things- a bit of an OCD habit but very relaxing) and I think this is a really lovely idea. It may seem like a strange thing to ask, but are there any categories of items that you're itching to collect more of? I'm in the process of cleaning out my Nana's house and there are all sorts of little treasures I have no place for. I'd love for them to go where they would be appreciated, rather than throw them out, and I'd be happy to send some your way if you'd like. You can convo me on Etsy (TwiceBitten) or Twitter (@TwiceBittenShop) if you're interested!